Timing is everything. Just when historians thought they were on the cusp of redefining the very meaning of the American Revolution—which is to say, now—along comes “Hamilton,” the musical. The general public, and not a few academics, have embraced the show, which reaffirms the old Whiggish narrative that the revolution set the foundation for liberal democracy. By casting Hamilton and the founders as mostly African Americans and Latinos, the show’s creator, Lin-Manuel Miranda, has breathed new life into the Whiggish view, one that a rising generation of historians (myself included) insists has passed its sell-by date. The irony is that Miranda re-appropriates the feel-good story for a group of Americans that scholars now generally agree the founders did little to embrace: minorities. Maybe there’s something of value in the Whiggish narrative after all? Or maybe not. It may in fact be a good thing that scholarship doesn’t easily succumb to popular enthusiasms. Indeed, if we look beyond “Hamilton,” the recent renovations in the scholarship on the American Revolution, decades in the making, suggest that historians today very much have their finger on the pulse. Today’s world is more global, more black and brown, and the recent scholarship reflects that: it brings in their voices, yet not by continuing to heroize the founders and simply cast them as black and brown, but by taking seriously the negative consequences the revolution often had for marginalized groups. Take just a small sample of books from the past year. In Bind Us Apart: How Enlightened Americans Invented Racial Segregation (Basic Books; 2016), Nicholas Guyatt argues that even the most liberal-minded founders laid the foundation for segregation. Kathleen DuVal’s Independence Lost: Lives on the Edge of the American Revolutions (Random House; 2015) focuses on the lives the War of Independence ruined when it breached the thirteen colonies and came to the Gulf Coast: Chickasaws and Creeks; African slaves; Cajuns; loyalists. Michael McDonnell, in Masters of Empire: Great Lake Indians and the Making of America (Hill and Wang, 2015), does something similar, showing how Native American groups in the Great Lakes region essentially called the shots. The revolution was perhaps sparked as much by European empires stumbling into internal Native American conflicts as it was by lofty ideas of liberty. But for other scholars, ideas still matter. Many historians of the revolution have grown adept at piecing together plausible narratives about the general ideas that inspired the people the Whiggish narrative left behind.. A little more than a decade ago, T.H. Breen, in The Marketplace of Revolution: How Consumer Politics Shaped American Independence (Oxford, 2004) provided a road-map, showing how consumer culture–objects like teacups, pins, boots and buckles—created a shared language for Americans of many different ethnicities, classes and genders. Not everyone may have read the same books, if they could read at all, but a vast number bought the same stuff. Boycotts worked—the revolution happened—because many people understood the language of consumption. A thriving scholarship on print culture has opened up another new vein. Almost twenty years ago (! ), David Waldstreicher lead the charge, showing how print sources, from newspapers to under-utilized sources like almanacs, could be read for what they revealed about popular political culture. Waldstreicher’s In the Midst of Perpetual Fetes (UNC, 1997) gave ample evidence of broad political participation expressed not through the means we typically associate it with—voting, jury duty, taxes—but parades, national holidays, and street protests. Yet if these political festivities helped create a national identity rooted in revolution, they also served as a kind of social control—one where political elites, almost always white men, tried to manage the revolution’s meaning. Simon Bolivar, an early leader of the Latin American Revolutions, made ending slavery a critical part of his revolution’s mission after the black Haitian government sheltered him. Image: Portrait of Simon Bolivar (1895), by Arturo Michelena (1863-1898) – Galería de Arte Nacional. Courtesy of Wikicommons. More recently, Janet Polansky has also used print culture to ground the American Revolution more firmly in a global context. In Revolution without Borders: The Call to Liberty in the Atlantic World (Yale, 2015) she follows revolutionary-era pamphlets, letters and novels as they made their way to and from Haiti, Sierra Leone, Poland, the U.S., Russia and France (to name a few). Peoples of many different cultures, classes and genders, she argues, embraced and often transformed the meaning of “revolution” to fit their individual circumstances. But all of them shared a sense that the “age of Revolutions,” as Thomas Paine famously dubbed it, would usher in a more egalitarian world. What emerges is in some ways a retooling of the ideological approach—but one that is more sharply attuned to the revolution’s failures. When the dust settled, a new age of nations, of empires, emerged in the revolutions’ collective wake, leaving only the promise of freedom, not its realization. 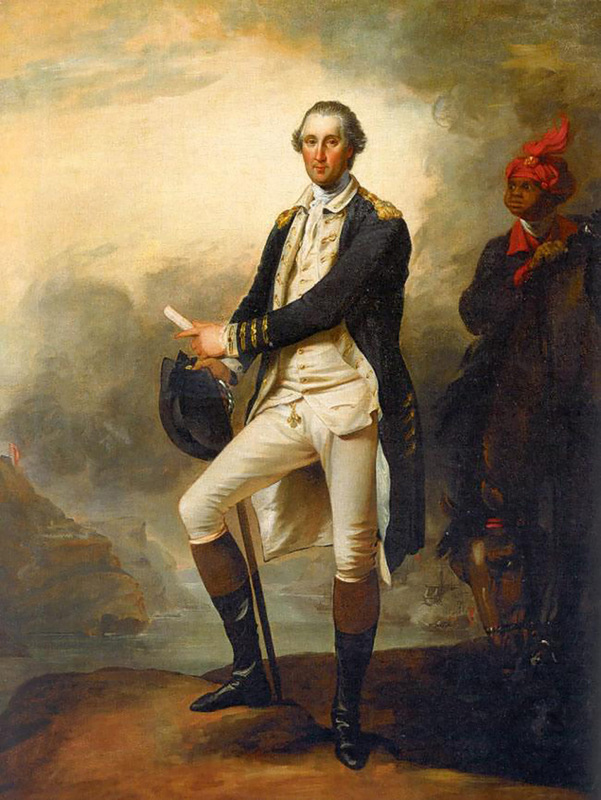 George Washington and his slave, Billy Lee. Image: George Washington and Billy Lee (1780), by John Trumbull. Courtesy of Metropolitan Museum of Art, New York. Perhaps nothing has done more to change our assessment of the American Revolution’s shortcomings than bringing it into conversation with the linked revolutions in Haiti and Latin America. The recent surge in scholarship on the Haitian Revolution—undoubtedly the most significant revolution that R.R. Palmer left virtually unmentioned in his otherwise magisterial Age of Democratic Revolution (1959-64)—has forced U.S. scholars to appreciate anew how limited the founders’ vision of liberty was when it came to slavery. Haitian slaves and free blacks, along with their white Jacobin allies, imbued the revolutionary era with a strong antislavery program, something that Haitian historian Laurent Dubois said amounts to an “enslaved Enlightenment” (cf. Robin Blackburn as well as David P. Geggus and Norman Fiering). The United States’ compromises over slavery can only be seen as tame by comparison. Similarly, the wave of emancipation decrees that came along with the Latin American revolutions in the 1820s and ‘30s—themselves directly inspired by Haiti’s example—only drives the point home. Caitlin Fitz’s forthcoming Our Sister Republics: The United States in an Age of American Revolutions (W.W. Norton, 2017) makes the point clear. Though America’s founders largely embraced the Latin American revolutions at their start, as antislavery became an increasingly prominent part of their revolutions, Americans began to renege their support. Academic interest in the American Revolution and its broader age shows no signs of waning. But might what we now know about these revolutions make them less inspiring with the broader public? The historian David Bell recently took on that question in his new book, Shadows of the Revolution: Reflections on France, Past and Present (Oxford, 2016), coming at it from the perspective of the French Revolution. In one essay, he argues that the French Revolution no longer provides an inspiring model for change in our times because, as scholars, we have become too aware of the high cost in human life. The French Revolution today evokes as much the guillotine as it does the Girondists. Even if it was indeed fought for worthy ideals—liberté, égalité, fraternité—we cannot forget that many heads rolled, and many wrongs turns were taken, along the way. In that sense, the new scholarship on the revolutionary era may not provide so much inspiration as caution. If the latest histories expose how much blood was spilled, how many promises were left unrealized, then the Arab Spring’s violent aftermath might strike us as less surprising, our hunger for a political revolution—whether called for by Bernie or Trump—a little less pronounced. Unfortunately, I don’t think that’s the kind message that makes for a hit Broadway musical. Eric Herschthal studies history at Columbia University, where he is writing his dissertation on the role science played in the early antislavery movement. His interests include early American history, the Atlantic World, science and slavery. Eric’s writing has also appeared in general interest publications, including The New York Times, Slate, The Atlantic and The New Republic. Follow Eric on Twitter @EricHerschthal.